Health is a valuable asset not only for an individual but also for the social system. A nation may progress more rapidly when the population are healthier and lead a productive life. As the man entered the modern era, he had been exposed to newer lifestyles, lack of physical activity, stressful working conditions, and adverse habits such as smoking, alcohol consumption, change in dietary habits which may have an adverse effect on his general as well as oral health. Oral health contributes to personal well-being and quality of life. Oral diseases are multifactorial in nature and affects humans of all ages and in all regions of the world; practically no individual in the course of a lifetime can escape from oral problems. In metropolitan cities, the life of common man is highly stressful because of the mechanical life they are compelled to live. The Metropolitan Transport Corporation (MTC) is the agency that operates the public transport bus service in Chennai, India. It is owned by the Government of Tamil Nadu. It transports an estimated 5.86 million passengers every day with its fleet of more than 5000 buses. Number of routes operated are 1662 with trips of about 42 per day covering a total distance of over 800,000 km (in the city and the suburbs) per day. Other than the State run buses, there are various private bus fleet services that operate to various cities. The private bus drivers differ from the MTC drivers in that they travel long distance, particularly during night time from Chennai to reach other cities. Moreover, they have more time off and less traffic problems, thus having a better working environment. The bus drivers have to shuttle tirelessly to cater to the public needs, various factors such as work shift, working environment, working posture, handling heavy materials, job stress due to the overloading and long working time, and limited time off have a significant adverse effect on the health among drivers. Studies in the past have shown that the drivers are at an increased risk of developing several systemic diseases and this may be invariably due to the air pollution during working hours or due to other risk factors, primarily related to tobacco habit and alcohol consumption. Hence among bus drivers, in addition to general health, oral health suffers due to relative lesser importance given to it. The use of products related to tobacco and poor oral hygiene practices adds to the oral disease burden among this population. The present data available on oral health status of professional bus drivers in India is insufficient to design proper dental care delivery to meet their oral health care needs. Since a comprehensive dental health promotion program for the professional bus drivers will improve their quality of life, this study was contemplated to assess the oral health status and treatment needs among professional bus drivers in Chennai. This descriptive, cross-sectional study was conducted to assess the oral health status and treatment needs of professional bus drivers who were working in the Government Institution (MTC) and those working in private bus agencies in Chennai. The study was conducted during October 2010 to March 2011. There were a total number of 26 bus depots operating under the MTC, Chennai, as per the records of Ministry of Transport, Government of Tamil Nadu. About 10,000 drivers are employed in MTC. Other than the State run buses, there are various private bus fleet services that operate to other cities. There were about 80 private travel agencies operating in Koyembedu, Chennai. About 2000 drivers were employed in these agencies. The participants who were above the age of 18 years and present on the day of study and who were willing to participate in the study and who had completed a minimum of 1 year of working experience were included. People who had a history of any systemic illness which might affect the outcome of the study were excluded. The sample size for the present study was calculated based on the data obtained from the pilot study conducted among 40 bus drivers at Annanagar West Bus Depot, MTC, Chennai, and also among 20 bus drivers at two private travel agencies, Koyembedu, Chennai. The prevalence of oral mucosal lesion (31.7%) was considered for the sample size calculation, as it constituted the major oral disease affecting this population. Applying the formula z2 pq/n, the sample size was derived to be 860. As there were about 10,000 bus drivers working in MTC and 2000 bus drivers in private establishments, the ratio of government and private drivers was found to be 5:1. Hence, out of the total sample size of 860, 660 government drivers and 200 private drivers were taken for this study. A simple random sampling method (lottery method) was followed in the study in two stages. In the first stage, 10 bus depots were selected randomly from the 26 bus depots operating under the MTC Chennai. In the second stage, 66 drivers from each of the ten bus depots were selected randomly, which made a total of 660 government drivers. Similarly, four travel agencies were randomly selected from each of the ten zones. 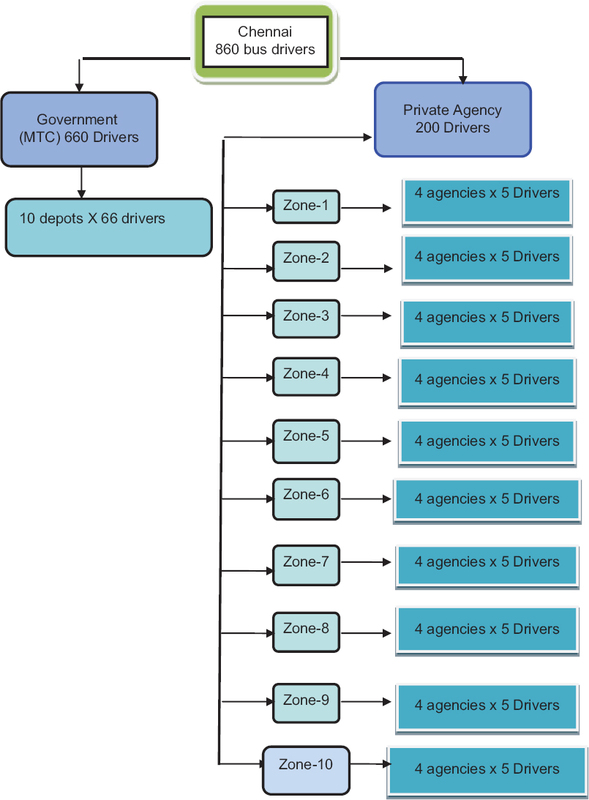 Five drivers from each of the travel agencies were selected randomly, which made a total of 200 private drivers [Figure 1]. Ethical clearance to conduct the study was obtained from the Institution Review Board, Ragas Dental College. Further, permission was also obtained from the Managing Director, MTC, and also from the Branch Managers of the concerned bus depots where the study was carried out. Permission was also obtained from the proprietors of the concerned private travel agencies where the study was carried out. Informed consent was obtained from individual participants after explaining the study protocol. Since a single examiner carried out the examination, intraexaminer calibration was performed. A total of 20 participants were examined using the study pro forma. The same participants were reexamined on a later date. Ninety percent reproducibility was found in all the participants. The field examinations were carried out by a single examiner and recordings were done with the help of an assistant. A specially prepared self-administered, pretested, structured questionnaire which was both in English and local language (Tamil) was given to the study participants to know the demographic variables, oral hygiene practices, tobacco usage, sweet consumption, and work-related stress. A 24 h diet chart was taken based on Nizel and Papas sweet scoring system 1989. Assessment of oral health status was done using the World Health Organization (WHO) Oral Health Assessment Form 1997 as described by WHO, Basic Oral Health Survey Methods (1997) using a Community Periodontal Index (CPI) probe and plane mouth mirror. Type III clinical examination as recommended by the American Dental Association was followed. The clinical examination was carried out under good illumination in the bus depot premises. All the participants present on the day of examination were examined. The participants were made to sit on a chair in upright position with proper headrest. The investigator examined the participants by standing on the right side of the patient during examination. The recording assistant was positioned seated on the left side of the patient close to the examiner so that he was able to hear the examiners instructions and codes and also the examiner was able to see the data being recorded. A table was also placed so that the instruments were within the easy reach of the examiner. It took an average of 15–20 min to complete the pro forma and questionnaire. The overall mean age for the study participants was 40.25 years. 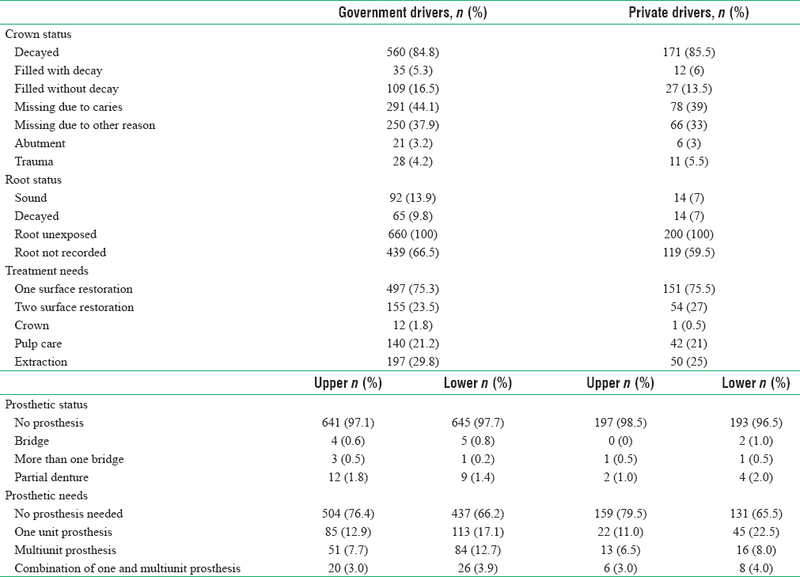 There was a significant difference between government and private drivers based on working hours per day (P = 0.000) [Table 1]. The majority of the participants studied secondary education (52.8%) among which majority were government drivers. In sweet score, majority of them were in “Watch out zone” (86.1%). In tobacco using habits, majority of them had the habit of smoking cigarette (19%). Among the total participants, majority of them (29.2%) had visited the dentist for tooth extraction, 60.9% felt stress at work and 9.1% had leukoplakia. 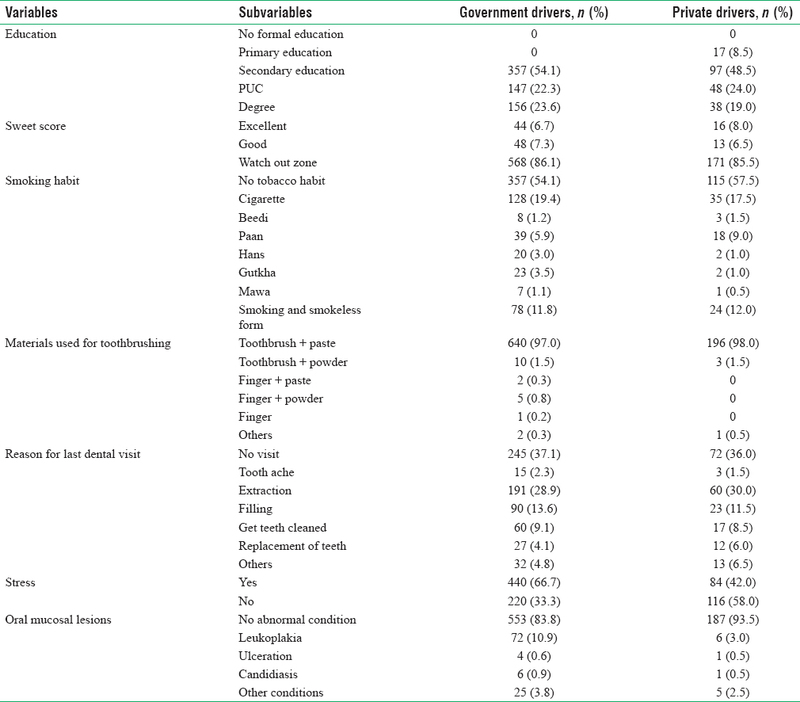 There was a significant difference between government and private drivers based on education, previous dental visit, and stress (P < 0.005) [Table 2]. Among the total participants, majority of them (54.8%) had calculus and majority of them (87.7%) had no loss attachment. 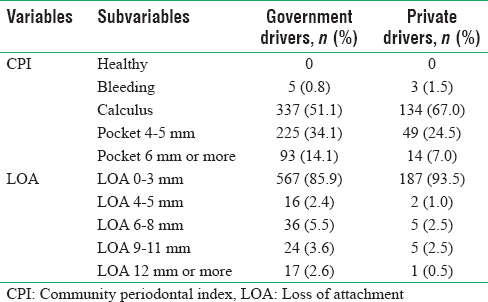 There was a significant difference between government and private drivers based on CPI and loss of attachment (P < 0.005) [Table 3]. The overall mean DMFT among the study population was 5.53. In dentition status and treatment needs, majority of them (75.3%) needed one surface restoration [Table 4]. There was statistical association between Sweet score and DMFT among the study population (P = 0.000) [Table 5]. In this study, majority of the population had completed secondary education because the government drivers are eligible to work in MTC only if they have completed their secondary education. It was observed that majority of the study population consumed coffee and tea more than three times during their working hours and were in watch out zone. The reasons for this practice may be attributed to the requirement of concentration during work and probably are one of the methods to relax at workplace. In the present study, there was significant correlation between sweet score and DMFT. This was similar to a study conducted by Akrad et al. and Masalin and Murtomaa. Of the total study population, majority of them had visited dentists for extraction. This was similar to the study done by Srikandi and Clarke, Kawamura and Iwamoto, and Hamasha et al. This was due to low socioeconomic status, lack of oral health awareness, lack of visit to dentist, fear of dentist, lack of time as working time schedule is less flexible, the cost of treatment was too high, and people visited dentists only at the severe stage. The present study showed that majority of them felt stressed at work which was similar to the study done by Chandra et al. and Dagli et al. This might be due to various factors such as work shift, working environment, working posture, long working hours, and limited time off. The present study showed that the drivers had the habit of tobacco chewing, smoking tobacco, and alcohol consumption. This might be due to they felt that these habits provide a kind of relaxation from their job stress. Prevalence of leukoplakia in the study population is due to their habits such as tobacco usage and alcohol consumption. In a study conducted by Reddy et al. among Karnataka state road transport drivers and employees in Mysore, the prevalence of leukoplakia was 3.1% and oral submucous fibrosis was 0.3%. The etiology and pathogenesis of periodontal disease involve a complicated interplay between the plaque etiological agents and various genetic and environmental risk factors. However, in the present study, the increase in the prevalence of periodontal disease might be due to the presence of practices related to tobacco habits and lack of awareness about oral health. The results in our present study were similar with a study done by Dilip, Mombiedro Sandoval and Llena Puy, Corbet et al., and Pilot et al. The increase in the prevalence of dental caries can be due to lower socioeconomic status, poor oral hygiene practices, and high sweet score. It is evident from this study that the mean of missed teeth component in the study population is more (7.54) than the mean component of filled teeth (0.425). This clearly shows that the drivers prefer to undergo extraction than restoring the teeth. The lack of dental visit, high cost of treatment, and lack of knowledge about dental care may be the prime reason for this. The findings in the present study were in disagreement with a study conducted by Ahuja and Darekar where the mean DMFT was found to be 0.74. The findings in the present study were in agreement with a study conducted by Petersen and Henmar, Tomita et al., and Aguilar-Zinser et al. The high prevalence of prosthetic status and prosthetic needs are in agreement with the study done by Sohi et al. and Naveen et al. This may be due to the lack of visit to dentists, low socioeconomic status, lack of time, and lack of awareness about the need to replace their lost teeth timely. The results of this study provided evidence to understand that the drivers find very little time to relax during their busy work schedule. The cumulative effect of oral diseases such as dental caries and periodontal disease was greater. Further, this study population has relatively poor attitude toward oral health as evident by majority of them visiting dentists for extraction. Most of the drivers were also consuming sugars as part of their diet. These practices, coupled with stress associated with their profession, increase the disease burden among this community. Hence, necessary changes have to be advocated to change their attitude toward oral health, dietary pattern, and adopt methods such as Employer's State Insurance Scheme and Group Insurance Schemes, yoga to reduce abnormal stress at workplace and provide this vulnerable group a harmonious environment so that the initiation and progression of oral diseases is intercepted at the earliest for the achievement of optimal oral health status. Sharda AJ, Shetty S. Relationship of periodontal status and dental caries status with oral health knowledge, attitude and behavior among professional students in India. Int J Oral Sci 2009;1:196-206. Naveen N, Reddy CV. Oral health status and treatment needs of police personnel in Mysore city, Karnataka. Streamdent 2010;1:156-60. Reddy CS, Reddy CV. Oral health status and treatment needs of Karnataka road transport corporation drivers and employees in Mysore division. J Indian Assoc Public Health Dent 2010;16:221-7. Akrad ZT, Beitollahi JM, Khajetorab AA. DMFT (Decayed, Missing, Filled, Teeth) Oral health index in sweets and cable industry workers. Iran J Public Health 2006;35:64-8. Masalin K, Murtomaa H. Work-related behavioral and dental risk factors among confectionery workers. Scand J Work Environ Health 1992;18:388-92. Srikandi TW, Clarke NG. Periodontal status in a South Australian industrial population. Community Dent Oral Epidemiol 1982;10:272-5. Kawamura M, Iwamoto Y. Present state of dental health knowledge, attitudes/behaviour and perceived oral health of Japanese employees. Int Dent J 1999;49:173-81. Hamasha AA, Sasa I, Al-Qudah M. Risk indicators associated with tooth loss in Jordanian adults. Community Dent Oral Epidemiol 2000;28:67-72. Chandra MK, Jayakumar HL, Vanishree N. Oral health status and treatment needs among Bank employees in Bangalore city, India. An epidemiological study. J Indian Assoc Public Health Dent 2009;14:169-75. Dagli RJ, Kumar S, Dhanni C. Dental health among Green marble mine laborers, India. J Oral Health Comm Dent 2008;2:1-7. Dilip CL. Health status, treatment requirements, knowledge and attitude towards oral health of police recruits in Karnataka. J Indian Assoc Public Health Dent 2005;5:20-34. Mombiedro Sandoval R, Llena Puy R. Periodontal status and treatment needs among Spanish military personnel. Med Oral Patol Oral Cir Bucal 2008;13:E464-9. Corbet EF, Wong MC, Lin HC. Periodontal conditions in adult Southern Chinese. J Dent Res 2001;80:1480-5. Pilot T, Lu ZY, Lin ZQ, Yen WP, Cao GR. Periodontal conditions in 35-44-year-old factory workers in Shanghai. Community Dent Oral Epidemiol 1989;17:216. Ahuja A, Darekar HS. Community dentistry in armed forces. Med J Armed Forces India 2003;59:18-20. Petersen PE, Henmar P. Oral conditions among workers in the Danish granite industry. Scand J Work Environ Health 1988;14:328-31. Tomita NE, Chinellato LE, Lauris JR, Kussano CM, Mendes HJ, Cardoso MT, et al. Oral health of building construction workers: An epidemiological approach. J Appl Oral Sci 2005;13:24-7. Aguilar-Zinser V, Irigoyen ME, Rivera G, Maupomé G, Sánchez-Pérez L, Velázquez C, et al. Cigarette smoking and dental caries among professional truck drivers in Mexico. Caries Res 2008;42:255-62. Sohi R, Bansal V, Veeresha KL, Gambhir R. Assessment of oral health status and treatment needs of police personnel of Haryana, India. Internet J Epidemiol 2009;9:1-8.